Elizabeth Miller inherited a lot of things from her father and grandfather: a love of farming. A belief in environmental stewardship. An instinct for innovation. And tea. Elizabeth and her husband, Chris Jenkins, are among the country’s few small-batch tea growers, tending to 200 fully established unique cultivars on a half-acre of land outside Salem, Oregon, that has been in Elizabeth’s family since the 1970s. 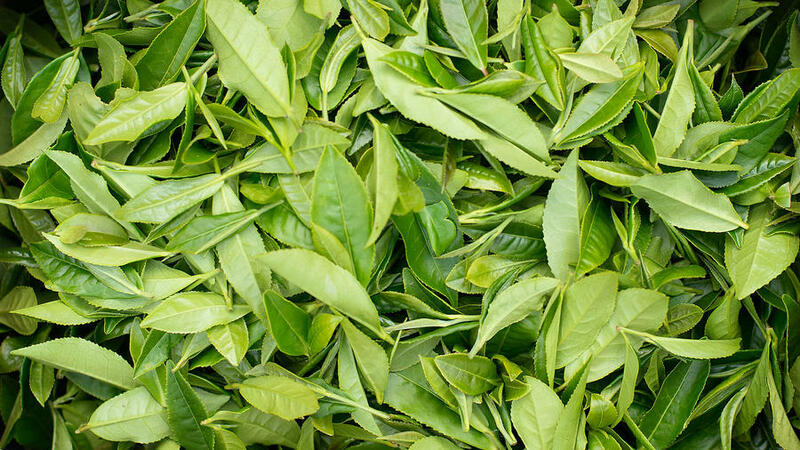 And with tea consumption booming (the Tea Association of the U.S.A. estimates that the wholesale value of tea sold in the United States reached more than $10 billion in 2014, with just a handful of acres under cultivation in the country), “it’s like we’re sitting on a gold mine,” Elizabeth says. Farming runs deep in Elizabeth’s bones. Her grandfather, Walt Miller, was a highly respected lumberman in Oregon, known for inventing a drying technique that turned poplar, then thought of as second-rate to hemlock and Douglas fir, into usable lumber. Elizabeth’s dad, Rob, went his own way, becoming one of the largest mint farmers in the world—likely responsible for the flavorings in your favorite toothpaste or gum. Like his dad, he was a trailblazer: He not only built a lab on his farm to measure the exact hour to harvest the most flavorful mint, but was one of the first people in the world to measure carbon sequestration in restoration plantings. Now it was Elizabeth’s turn to make a generational pivot. “I wanted to approach farming from a culinary angle: to grow food,” she says. Armed with an anthropology degree from Colorado College—and knowing she had a lot to learn—she lured her then-boyfriend (now husband), Chris, to join her on the job at Knoll Farms in Brentwood, California, one of the oldest organic farms in the state. It was the best year of their lives—and the worst. Chris, who’d grown up in Columbus, Ohio, would never even have gone into farming but for his love of Elizabeth. “It was a litmus test of how I’d do in the field,” he says. Wide-eyed and idealistic, they quickly got their hands dirty. Working “farmer hours,” sunup to sundown, they dug holes for a new orchard, sowed endless rows of spinach and lettuce mix, lugged around heavy buckets of manure to fertilize crops, and every Saturday, brought their products—figs, rosemary, and green garlic—to sell at the iconic San Francisco Ferry Building farmers’ market. “That year was a rite of passage as well as a test of our bodies and our endurance,” Chris recalls. Elizabeth got carpal tunnel syndrome (from screwing and unscrewing hoses) and ringworm from who knows what; Chris got shingles from stress. But they learned how to sweat together and support each other in launching a career that’s just as much about lifestyle as work. An intuitive plant person, Chris found that agriculture also tapped into his love of problem solving. “No other profession is so challenging yet so life affirming as farming,” he says. “I’m always learning. I can master certain skills, but to be a good farmer, I have to stay open and curious.” For her part, Elizabeth gained independence from the family farm and reaffirmed that there was a market for high-quality vegetables. But after a year working for someone else, the duo was ready to run their own farm back home in Salem. Not only could they use land, tractors, and sheds owned by Elizabeth’s dad (paying him back over time), but the soil couldn’t be beat: Seasonal floods from the Willamette River, which cuts right through their 40-acre parcel, had created rich alluvial bottomland. But Elizabeth wanted to do it her way. “My hope was to continue my family tradition of agriculture, but do it in a way that could be shared by the Salem community.” Though Salem sits just 50 miles southwest of Portland, with the same easy access to mountains, beaches, and wine country, it can feel a world away: Slow-paced and surrounded by traditional farms, it’s not known as an incubator for innovation. Elizabeth wanted to buck that trend and make Salem a place she felt proud of. So she and Chris returned to the farm in 2008, moving into a farmhouse on the property that had once been home to a hops-farm foreman in the 1910s when Salem-area farmers were growing the crop for beer. If the year at Knoll Farms had been like Farming 101, they were now in graduate school: After planting 40 acres of organic vegetables, they began a community-supported-agriculture farm, Minto Island Growers (mintogrowers.com), for shareholders who receive a weekly box of fresh veggies in the growing season. Next, they built a destination farmstand, complete with a food truck that serves salade niçoise with homemade dilly beans, gazpacho, and strawberry milkshakes, all based on Elizabeth’s mom’s home recipes. And finally, they added a U-pick area of flowers and blueberries (adjacent to the bushes planted by Elizabeth’s Grandpa Walt). By 2012, they’d found their groove as farmers—but were still looking for their own version of poplar plywood or mint. That spring, falling a bit short on what to put in their weekly CSA box, they turned their attention to an experimental patch of 200 cultivars of tea that Elizabeth’s dad, Rob, had planted in the late 1980s, using plants collected from around the world by his business partner, John Vendeland. The tea was high quality (Rob once hosted a Japanese tea expert who dropped to his knees in shock at how healthy the plants looked) but it had sat, mostly ignored except for yearly maintenance, for almost 25 years. Now, though, the tea plants were pushing out their tender spring flush, so Elizabeth and Chris picked the tips and bagged them for their CSA customers, adding advice on how to process them to make tea. And the couple feels a great responsibility to get the tea right. “It’s the most complex plant we grow because processing it is an art form,” says Elizabeth. “In China, it’s a lifelong pursuit.” Even more challenging is the fact that experts hold their methods close to their vests, something Elizabeth and Chris had never experienced. “It’s totally intimidating,” Elizabeth says. Their processor, Balazs Henger, a Washington-based chef and tea fanatic, went to China in 2014 to study with the masters and has since begun retrofitting farm equipment to try to re-create “the dancing of the leaves” he saw there. A USDA grant helped the couple create packaging and expand production, and in 2015 they began offering a shelf-stable product to sell online (green, oolong, black; mintoislandtea.com). “People are freaking out,” says Elizabeth. “They love the thought of buying small-batch, American-grown tea.” Customers say they never knew that tea had so many complex flavors (Minto Islands’ black is piney; the oolong is sweet). But mostly what people like is the tea’s freshness. “Our spring flush starts in May, and we’re selling that crop a few weeks later,” Elizabeth says. “The tea you buy in a supermarket might be years old.” Like any food you taste fresh for the first time—tomatoes, corn, freshly pressed olive oil—the experience is eye-opening.